Maureen grew up in rural Northern New South Wales before attending university in Brisbane to study a Bachelor of International Business and a Bachelor of Commerce majoring in Marketing. Maureen then moved to the Hunter Valley and then Canberra working for multinational businesses and the Government before making the lifestyle choice to move to Tasmania in 2004. Maureen joined the Harcourts Launceston team as a sales consultant after obtaining her sale consultant and property management registration and within a year opened her own real estate office in George Town in order to provide more expert real estate services to the George Town and East Tamar region. Maureen believes that having an office based in the area you serve means that you can provide prompt, efficient services and an understanding of the local area and real estate market, it also shows commitment to the area. Since opening Harcourts East Tamar, it has gone from strength to strength providing top level sales and property management services. Maureen has a strong commitment to continued education and learning both for her team and herself, having also obtained her Diploma of Real Estate and in recent years her Masters of Business Administration. This along with Maureen’s experience across all areas of real estate, from administration to property management as well as a strong sales background and her personal experience buying, selling and having investment properties provides Maureen with a unique background and skill set which is hard to come by. This unique background provides Maureen’s clients, whether they be purchasers, vendors, landlords or tenants with expert advice, strategies and options based on an understanding of their needs and goals. This helps Maureen achieve exceptional customer service for her clients and outstanding results. Originally from Queensland, Carley made the move to Tasmania in 2010 and finished her schooling here. After finishing school Carley decided to stay in Tassie after falling in love with our beautiful coastal town. Carley joined the Harcourts East Tamar team in 2016 as the Client Service Manager, where she was successful in gaining a traineeship and undertook her Cert III in Business. Carley’s passion for real estate was obvious from the start and she was quickly promoted into an office support role assisting both property management and sales departments at Harcourts East Tamar. Carley then gained her Property Consultant registration and joined the award winning sales team providing both administration and marketing support and working with buyers. Carley’s organised and enthusiastic approach to real estate is extremely valued by her co-workers and clients. When Carley isn’t in the office she enjoys being active in the community being involved in the local touch football team and the newly formed woman’s AFL team. Erin is a true local, she was raised in George Town, educated in George Town and while she did spend some time in WA she came back 'home'. Erin has also lived for a short period of time in the beautiful coastal village of Tam O'Shanter. Erin was given the opportunity to join the Harcourts East Tamar team in 2015. Her passion for sales was evident and has been working closely under Andrew Michieletto and Maureen Lacey in the sales team selling almost 4.6 million dollars’ worth of property in a short amount of time. When you meet Erin you can tell that real estate isn’t just a job for her but a lifestyle, and she has a genuine love for the town and area she grew up in. Erin has recently brought her own block of land in George Town where she is keen to start building her first home! When Erin isn’t selling properties she enjoys the chance to spend time with her husband and her animals, especially her two dogs Odin and Luna. Erin strives to give the best service to all customers with her extensive knowledge of the local area and the real estate market. Claire is a local who grew up in George Town. After completing a certificate in retail, Claire left Tassie and moved to Western Australia, where she spent a several years gaining valuable experience and knowledge in all facet of retail, and became successful in retail management. Many of these skills have been transferred to her current role where she provides outstanding customer service at Harcourts East Tamar. On returning to Tassie, Claire became happily married and focused on raising her 3 children, in beautiful George Town. Claire then stepped back into the work force at Harcourts East Tamar, initially in an administration role where she was able to stream line processes and procedures before she was able to follow her interest in property management. Claire studied and gained her Property Management registration and is now focused and driven by all facets of her role in property management. Being a local, Claire always likes to not only meet but exceed our client’s expectations. Rachael joined the Harcourts East Tamar Team, as an Office Administrative Assistant on a traineeship at the beginning of 2015 where she experienced all aspects of real estate. Rachael then joined the Property Management team and it became her passion. Rachael was then a Property Management Assistant before being promoted again to Property Portfolio Manager. Rachael has extensive knowledge and understanding of all areas of property management and is a true professional who takes care and pride in providing exceptional service to her clients. Rachael has lived in George Town all of her life, where she attended Port Dalrymple School. 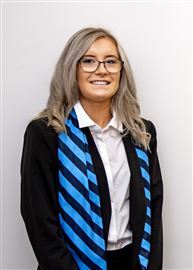 Rachael continued her schooling at Newstead College where she completed year 11 and 12 taking a particular interest in business and real estate. Rachael completed her Certificate II in Business at Newstead College and continued studying here at Harcourts East Tamar, where she completed her Certificate III in Business as well as gained her property management registration. Rachael is now studying for her Diploma in Property Services. Rachael's passion in real estate was ignited when she completed work experience at Harcourts East Tamar when she was in year 10. This experience inspired Rachael to pursue a career in real estate. She then participated in work experience while at College at another real estate agency and also Harcourts Launceston. Rachael loves living in George Town and is very happy that she gets the opportunity to work in her home town and the community. Rachael loves that George Town has a lot to offer the community and its visitors and has beautiful beaches. Rachael was born and raised in George Town and began her real estate career within our Accounts department in 2014. Rachael is highly focused and efficient and thrives in the fast paced environment. Enthusiastic, proactive and dedicated to her job, Rachael is an asset to our team. Rachael has four wonderful children and husband that keep her busy. They love anything outdoors, whether it is motorbike riding, horses or just pottering around and taking advantage of the beautiful State we live in. Rachael is also an animal lover! Rachael has also enjoyed buying, building and selling - numerous times (and always says, this is her last ...). Tyra joined the Harcourts East Tamar team in 2018 on a Business Traineeship. You will find Tyra's big smile as you walk in the door or hear her friendly voice when you ring the office. Tyra is always happy to help all of our clients. Tyra has lived in George Town her whole life and loves living here with my family and friends. She attended South George Town Primary School and then attended Port Dalrymple School in high school before attending Newstead College and was then successful in gaining a traineeship at Harcourts East Tamar. I enjoy being with family and friends and going to the beach in my free time. WOW!!! Look at the prices! Brand New Home Built In 2018! A Centrally Located Great Buy! Buy Two Get the Third Free! Be Where Gen "Y" Wants To Be! Take A Look At This Price!